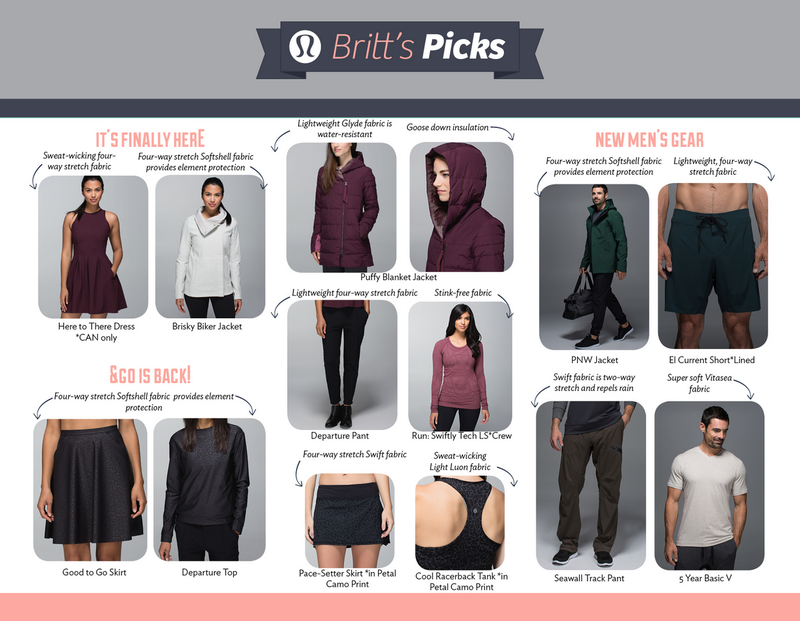 Britt’s Picks came out sometime yesterday. Sorry I’ve been a bit MIA from the blog but I’m actually on vacation in Las Vegas and while I thought it wouldn’t interrupt my blogging schedule at all it has. We’ve been away from our hotel room from early in the morning and not back till late and It’s been so exhausting that I haven’t dug around for photos. Oops! Sorry! I’ll be back at it tomorrow. In the meantime I had some productive shopping here. I had my heart set on buying a pair of boots but the ones I wanted weren’t available here so I got the Puffy Blanket Jacket in black instead. It’s quite nice on actually. I didn’t expect it to be as flattering as it was and the fact that its water resistant sold me. I also scored a great deal on some Tory Burch flats at the outlet. Hope this next upload will be a total dud. "Cocoon Car Coat, Purple Fog Reversible Wunder Under Crops, Bumble Berry Swiftly SS and More"
"Petal Camo Cool Racerback, Fuel Green Right As Rain Jacket, Petal Camo Run Inspire Crops, Seek The Heat Bra"